The Portland Canal Mining & Development Co. Ltd was incorporated in 1907 and acquired the Little Joe and Lucky Seven claims on Glacier Creek from McGrath and Griffen, and a number of other claims from other interests. Development work was started on the ore showing at the point of discovery and as time passed a large amount of underground work was done, in the conjunction of building a mill of 50 tons per day capacity, later increased to 75 tons per day, the laying of an air pipe line and an aerial tram line from mill to the mine at an elevation of 2,400 feet. But after operating for a year or more ore bodies did not prove extensive enough, nor of high enough grade to maintain profitable production, and the mine was closed down to remain idle until two years ago, when the property was acquired at tax sale by local interests and some prospecting work carried on in an endeavor to locate new ore bodies. The mineral deposit exploited consisted of a quartz vein averaging eight-foot wide, carrying galena and zinc, with fair quantities of gold and silver. The vein was developed by three drift adits 50 feet apart vertically, and two ore bodies were mined. One was 160 feet long and from two to ten feet thick and extended 350 feet down the dip. The other was 120 feet long and about the same width as the other, and extending a similar distance. During the operation of the mine some 7000 tons of ore were mined and some 2,500 tons of concentrate shipped. The crude ore averaged around $10 per ton. 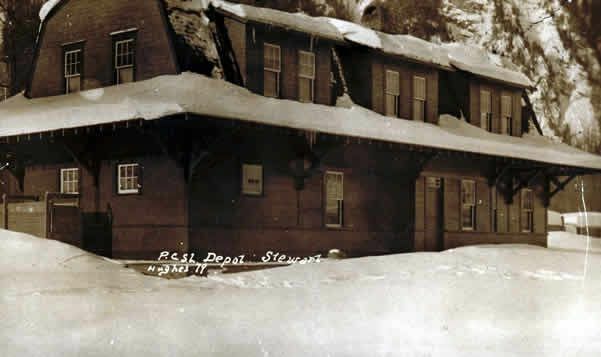 The company secured a charter for a railway from Stewart to the interior, which was later acquired by S. D. D. Mann, and the Portland Canal Short Line Railway was incorporated and 14 miles of road built up the Bear River Valley to Red Cliff. The line was operated for a short time, but with the dull times following the boom years of 1910-11 operations ceased and nothing further was done until 1928, when the charter was taken over by H. H. Stevens, who rebuilt the railway bridge across the Bear River and rehabilitated considerable trackage. Later the charter again changed hands to come in the possession of the Consolidated Mining & Smelting Co., the present owners. While work was going on at the Portland Canal Mine, the Portland Canal Tunnels Co. Ltd began the driving of a long tunnel to open up the Glacier Creek vein system at depth. The tunnel was driven 5000 feet to crosscut the various veins exposed on the surface, but no large body of commercial ore was encountered. Part of the tunnel is now used by the Dunwell Mines Ltd in connection with the development of power for the mine and mill.